From the local community presence is associated with the legend of Bukit Bujang Tenebrous Beji and Tumenggung Marubai. Bujang Beji and Tumenggung Marubai is the chief of the fishermen in the State Sintang (capital city Sintang now). Bujang Beji Kapuas River and its control group, while the control group and their Marubai Tumenggung Melawi River. Because of differences in fish catches, appear ill Bujang Beji to close Melawi River flow with a large stone. Then, he went to the Kapuas Hulu to lift a large stone located at the top of Mount Nanga Silat and took him to the River Melawi. However, at the intersection of the Kapuas River and River Melawi, goddesses of Khayangan rollicking laugh. When tilting the head to find the home sound, without realizing it, he stepped on poisonous spines. Immediately, despite assuming the stone and then immersed in a place called Jetak. 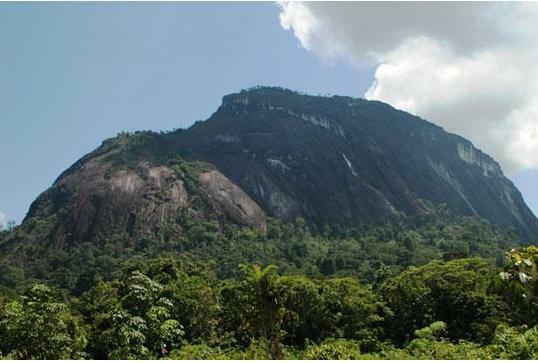 According to legend, a large stone which was then immersed in Jetak grows slowly into a hill. Today, the hill known as Bukit Tenebrous, a unique and exotic sights are much admired by domestic and foreign tourists. Dark Hill Named because of the stones found on the hill is black. On this hill there are also rare plants such as Giant Pouch Semar which by local people used as a vessel for cooking rice, but it also contained the Black Orchid. Currently, the area of Bukit Tenebrous already direnopasi and the region serve as the Center for the scout camp. To reach the top of Mount Tenebrous are now built a ladder to a height of ± 90 m, which is adjacent to the west.